Maureen McQuerry - author of "Student Inquiry: Conducting Real World investigations in Your Classroom"
Authentic learning matters because it gives learners a vision of the possible. Students connect skills and subjects to meaningful real world products that are valued by our culture. They discover how subject areas are integrated, how to take a process from conception to completion and how to find answers to challenging problems. Steve Revington's authentic learning website explains the process of authentic learning and is a fine model for best practices in education today. If you want your students to enjoy mathematics and also understand it, have a close look at Steve Revington’s authentic learning website. In too many classrooms teachers have their students memorize rules such as: move the decimal point when you multiply by a power of ten, when dividing by a fraction, invert and multiply, the square on the hypotenuse is equal to the sum of the squares on the other two sides. However, for students to make sense of mathematics, they need to connect mathematical symbolism to their concrete world. Can the students link the mathematics they learn in school to everyday practical situations and applications? Do students understand why these rules work? Instead of having his students memorize rules in an abstract vacuum, Steve Revington provides a variety of authentic activities that help students make sense of their learning through doing, visualization, discussion and relevance. His students not only enjoy their mathematical experiences, they perform extremely well on typical national and international math competitions. Productive workers of the 21st century need to be creative and able to work collaboratively, if society is to progress. Authentic Learning can help students achieve their true potential. I was completely stunned and amazed the first time I attended one of Steve Revington’s authentic learning open houses. Walking into his grade five classroom, my students and I were surrounded by the sights, sounds and smells of an ancient Egypt market. His students had completely transformed into citizens from ancient Egypt with authentic names, costumes, trades, market stalls and wares. All students were completely immersed in their roles and eager to share their incredible knowledge as they were asked questions about their daily life, trades, and family backgrounds. I remember telling my own family about the amazing experience my class enjoyed that day, and saying “I could never do that.”With Steve’s expertise and always-patient support, I have now provided several fantastic authentic learning experiences for my own grade three and four students. When my students are engaged in authentic learning, they are completely immersed and motivated as they explore the questions they are interested in. I am amazed by the learning that takes place as our days are transformed into an integrated stream of math, language, fine arts, science, social studies, drama and music activities all relating to the topic. Enthusiasm, cooperation, motivation all increase as classroom management issues fade. Students develop their own curiosity, gain self-confidence, make connections and experience the invaluable power and joy of learning. Mike Tuckwood - Teacher, Chartwell Elementary School. West Vancouver, B.C. When I first heard about authentic learning, I was both excited and skeptical. As a young teacher it surprised me that I had not been introduced to this style of teaching and learning in Teachers College. But, after working with Steve for a year I quickly came to realize that authentic learning is without a doubt the most meaningful way to approach education for students and teachers today. Taking the approach of hands on, real world learning enables each child to find value and purpose in whatever unit they are studying. In authentic learning, students have the responsibility to create something tangible and applicable to the real world, as opposed to simply recalling and memorizing information that can be found with one click of a mouse on the Internet. Authentic learning challenges their creativity and takes learning deeper through role play, technology, fine arts, interacting with members of the community, and establishing connections with cultures and people from around the world. Through this style of teaching, we are creating students who'll be confident, contributing members of society who understand that education is not limited to the four walls of a classroom. If more teachers truly embraced authentic learning, the future of education would be brighter and students would be better equipped for success in life after school. It was over twelve years ago that I was in Mr. Revington’s grade five class, yet it is one of the most memorable years of my education. I was given the opportunity to learn from a unique perspective and approach, referred to as authentic learning. I knew at the time I was lucky to be in his class, all my peers were hoping to be. A year earlier, in grade four, the classes all saw the work and the products from the students in his class and we were in awe. They had the ‘coolest’ projects and made the most amazing displays, and in the end they had so much to show. Little did I know at the time, they had worked really hard, both as a team and independently to accomplish all they had. ​When I got the chance to be involved in all the fun, I realized how important it made me feel to be a part of something that felt so big. Each student took on a role of a person in a topic we were covering. We were treated like scientists or Ancient Egyptian characters for example, and expected to be knowledgeable enough to act in character. I had the opportunity to express my own sense of creativity and was constantly working and motivated. Not only did we have continuous opportunities to show how responsible we could be, we also got second chances. 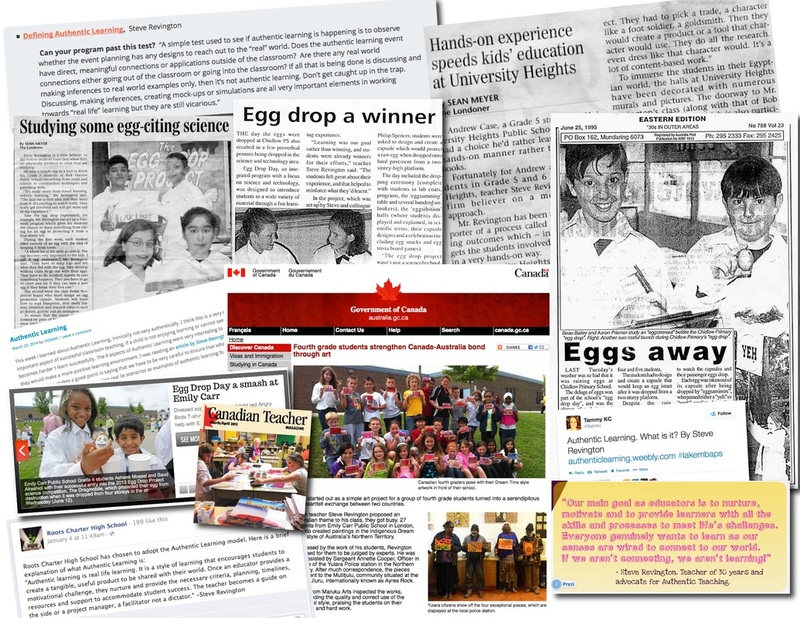 ​Even after all these years I can easily recall the two main topics we covered that year, Ancient Egypt and the Egg Drop Project. When we worked on our Egyptian unit much of our school work was focused around it. I was a 'scribe'' and it was so different than anything I had done before. I remember that our motivation came from both intrinsic and extrinsic sources and being proud of the work we had accomplished. We wanted to be there. The Egg Drop Project meant even more to the students, as it was such a fun project and we took on many roles throughout each stage. I will never forget the feeling of being in my white, scientist lab coat in front of the school with my capsule for the egg drop, and feeling on top of the world. It was in this grade five class that I really began to develop my love for learning. ​This style of learning made such an impact on my life, that twelve years later I wanted to find out where Mr. Revington was teaching and volunteer. I wanted to understand how he taught so that I could have that same impact on the children I'd like to work with in the future. The way he motivated the class, expected each student to reach their potential and excel in their own way, are some of the reasons my peers from that class still love reminiscing about that year. We wanted to learn. From my point of view as a student, authentic learning has influenced my life greatly. Learning done in such a manner not only gives knowledge and it teaches one to apply it. You can teach kids math, English, etc. until they know it backwards and forwards, but if you don't teach them to apply their knowledge it is worthless. For example ... you are teaching grade three students their multiplication table. If you just hand out paper after paper they will learn it, and as soon as the unit is done they will forget it all. However if you present it in such a way that it is fun (e.g. a game) it will be more memorable. But of course games are only the preparation level of authentic learning. The possibilities are endless! I have experienced the wonder of the Egg Drop Project. Last year my partner and I had to design a capsule that could protect an egg from a two story drop. I learned science, math, English etc. from the experience. And the way I learned these things, is unforgettable. I can still envision my capsule dropping. I learned more in just that unit than I did in all of grade 4. The impact this type of learning has had on me is tremendous. I wish everyone could have the same experiences. I know I could use this space for a long and detailed account of what I think the pros and cons are about authentic learning. I am aware that there are words that would put frills and lace around the true meaning of authentic learning, but I can't. I'm going to tell you exactly what authentic learning is like from my view point. In grade four I wrote an essay. I worked long and hard on it and was ao very proud of the A+ I received but I wanted something more. I was so proud of it, and had worked so hard on it and I wanted everybody to read it and to know all about it. Now I can't even remember what the essay was about, but I can remember the disappointment I felt. I also remember in Grade five, the Ancient Egyptian Living Museum. I remember it like it was yesterday. I even remember some of the chants that priestesses did, and how an Ancient Egyptian mill worked. Authentic learning is enchanted learning There is no way I will ever be able to forget how it felt, explaining to the London Free Press newspaper what a sistrum (an ancient instrument) or what part Anubis played in the The Book of the Dead. Nor wilI I forget how it felt holding up the 'YEA!' sign when my capsule was dropped from four stories with a raw egg inside and the egg made it! Or painting murals, or making mosaics or creating real Ancient Roman medicines, or having an opportunity at getting a non-fiction book published at eleven. These are things that one cannot simply forget. Learning is about more than acing a test, or handing in a piece of paper or getting good grades. One thing that I can guarantee is that I would MUCH rather get a D doing authentic learning, than get an A doing regular school work. Amanda as a Roman engineer. I was in Mr. Revington's class for two years. I found that authentic learning helped me remember things I learned. Authentic learning is hard, but it's also fun, and once you've experienced it you will be proud of yourself and feel more confident. These are the authentic learning events I've done with Mr. Revington: Medieval Living Market, Ancient Roman Living Museum, The Egg Drop Project, Energy Saver Sellers, Slope Car Challenge and Tower Building Challenge. All of these events improved my confidence and I had fun doing them all. I wish all teachers did authentic learning. Tay as a Roman perfume maker. I just participated an Ancient Roman Living Museum authentic event. I was a perfume maker. I will remember forever how to make perfumes and the science behind it. I was in Mr. Revington's class last year as well and I was a weaver at our Medieval Living Museum Market. I still remember how to weave and it is a skill that will live with me forever. My other favourite was The Egg Drop Project. We made capsules that could safely drop an egg from a great height, successfully without breaking. I learned about aerodynamics, how to parent and what being in court was really like. It's not just about learning things, it's about learning through experiences. I think I remember things better learning this way. When you learn through authentic learning it's more memorable and fun. I would encourage other teachers to do authentic learning events. I have participated in The Egg Drop Project, Slope Car Challenge, Medieval Living Museum and Ancient Roman Living Museum. As a child who is identified as gifted, I found that the learning I did in Mr. Revington's classes were even better than what I was learning in my gifted programs. The Medieval Living Market was my first authentic learning experience and I thought it would just be a typical show, but it was the best experience I'd had. I really think that authentic learning is a totally different and better type of learning experience. It helps you really understand a topic and makes you feel like you have actually accomplished something, besides just memorizing answers for a test. I would like to learn this way throughout all my grade school years. I wish that authentic learning was part of every curriculum. Seven years ago, in grade 4 and 5 ,I had the opportunity to experience authentic learning firsthand. Although the projects weren’t always easy, the impact they had on me and the memories I created will last forever. As a shy and quiet kid, these experiences were intimidating to me at first, but as we did more of them, I became more confident and had so much fun with each one. My favourite projects were the Medieval and Egyptian open houses. I was surprised by how comfortable I was taking on the role of someone from a time period that I had never really learned about until that year. I enjoyed how each topic or unit we learned about included an interactive part where we could get involved and dig deeper into the topic. I still have many of my projects including my balloon car, the egg baby shell I took care of for a week, my egg drop capsule blueprint and all of my Egyptian unit notes. I just can’t let go of them. The memories my classmates and I shared will last a lifetime. I constantly find myself thinking back to those years and realizing how beneficial they were to me, boosting my confidence and increasing my knowledge in a memorable and exciting way.